How do you clean the tiles. What do you use? Our Diamond Grid-Loc Tiles can be easily cleaned with a mild soap and water solution or with a garden hose. I live in Ohio, what happens when the snow and ice (salt) melt from your vehicle onto the garage and get below the tiles? Do you put something underneath the tiles? If your garage has a grade to it, the water and salt should flow out of your garage. Since these tiles do allow water to flow under the tiles, you can hose the surface of the tiles allowing water to flow under the tiles. We also sell Auto Floor Guard container mats that help to keep the snow, ice, and salt from getting under the floor. Are there any health concerns as it pertains to the toxicity of the product? Is it a rubber or non-rubber material? Our Diamond Grid-Loc Tiles are very safe and are constructed with a hard polypropylene plastic. What preparation is needed for placing tiles on cement cracks in the garage?? If the cracks in the garage are small cracks with no height variation, then no preparation is needed. If the cracks are large and have a significant difference in height, then leveling your concrete would be necessary. To level your concrete use of a leveling compound is required. If a tile does become damaged in the center of my garage am I able to replace that single damaged tile? You can replace a single Diamond Grid-Loc Tile with the use of a paint can opener. Place the opener on one end of the tile and pull up. Once removed, you can place the new tile in its place. Are these tiles non-combustible? I would like to put it on a wood floor. Our Diamond Grid-Loc Tiles are non-combustible. To remove a few tiles in the middle of a floor, we recommend using a paint can opener. You will place the opener under tile you are looking to replace and then lift up. Once removed you can put the new tile in its place. Can these tiles be installed over an asphalt base? Our Diamond Grid-Loc Tiles can be installed over an asphalt base. Do you ship to Canada, we use a lot of dirt on our roads that we scrape off our garage floor in winter, would we be able to scrape off the Diamond tiles? We do ship to Canada and you would be able to remove dirt and grime from our Diamond Grid-Loc Tiles with ease. We recommend using a hose and broom. I like the black and white tile, is it suitable for a barbershop and can I place in over linoleum? Our Diamond Grid-Loc Tiles would work as flooring in a barber shop. Due to the extended amount of standing that is required to cut a person's hair, we would recommend going with our Diamond Flex Tiles which provide more comfort under foot. Our Diamond Grid-Loc Tiles can be placed on​ a linoleum floor. Will liquid go in between the cracks on the Diamond Grid-Loc Tiles? Liquids are able to penetrate between our Diamond Grid-Loc Tiles when installed. Do I need to lay an underlayment on the floor first? Also how critical is leaving a half inch space between tile and wall? An underlayment is not necessary under our Diamond Grid-Loc Tiles. We do recommend placing a rubber underlay under these tiles to help reduce noise and also add extra comfort under foot. The 1/2" expansion gap is necessary for areas where there is no temperature control. If the area where the flooring is installed is temperature controlled and void of any direct sunlight, you wouldn't necessarily need the expansion gap. We do recommend having an expansion gap in all installations due to the fact that things do happen and you never know when your air conditioner or heater might fail. If you are installing this floor in a room in your home, you can cover the expansion gap with a quarter round which will hide the gap and create a nice finished look. Are the diamond grid-lock titles slip resistant? Would they keep wet tires from sliding? Our Diamond Grid-Loc Tiles are slip resistant. The diamond pattern is what helps to keep the tiles slip resistant even when wet. This does not mean that your tiles will not slip under all conditions, but under most conditions, these diamond pattern will give your tires the proper amount of grip. Are these tile good for making an aerobic exercise platform, to be used on top of a carpeted floor ? Our Diamond Grid-Loc Tiles are a hard plastic tile that may not give you the type of give you are looking for. Also, even though they feature a diamond patterned top, they still may not give you the type of traction you need for your exercises. For those types of exercises, we recommend going with one our rubber flooring options. Can these tiles be installed over a dirt floor? I have a detached garage with dirt floors right now. I plan to tamp down those floors, add pea gravel, tamp that down, then install a vapor barrier, shock pad, and rubber tiles. Is this an option? Ideally, we would recommend installing our Diamond Grid-Loc Tiles over concrete or asphalt. When placed over dirt, there is potential for the tiles to embed themselves into the dirt. This may create an uneven surface that is unsightly and not the safest. Will oil, gear oil, or transmission fluid damage the tiles or stain them? Our Diamond Grid-Loc Tiles are resistant to most car and household chemicals. Oil, gear oil , and transmission fluid would not stain these tiles. My garage floor is made up of 6 concrete slabs all separated by expansion joints. Can this flooring be put over the expansion joints without filling them. I was really hoping to avoid having to fill the joints by finding a flooring that is strong enough to go directly over them without damage or deform with the weight of a car over the joints. Our Diamond Grid-Loc Tiles can be installed over your expansion joints without filling in the expansion joint. These tiles are made from hard plastic polypropylene and would be strong enough to keep their integrity when installing over your expansion joints. I just ordered your diamond grid-loc tiles and the shock rubber underlayment. My question is with the underlayment and moisture. I live in the Midwest and see plenty of rainy days and snow, and often the cars bring water into the garage. The water currently mostly seeps into the cement, and the rest evaporates quickly. I bought the underlayment for the sound issue but do not want mold brewing beneath my floor. Do I want to make sure this underlayment is sealed at the seams to prevent any water underneath it or would it be prudent to cut the underlayment along the expansion joints of the floor (where the water normally goes and disappears quickly)to let the water drain? It seems letting water underneath these mats would cause mold issues on the concrete but also water sitting on top of the rubber would take a long time to evaporate. Please advise. Thanks. Mold would not grow under our Shock Pad when installing under your Diamond Grid-Loc Tiles. Rubber inherently mold and mildew resistant and will not harbor either of them. The only time you will see mold is there was food left on the underlay. Water will easily evaporate from the rubber. Since this material is also somewhat porous, the water will also flow down to the concrete below. No cutting or sealing would need to be made. If i put this in my basement and some water gets under it will the mold and mildew be a problem? Our Diamond Grid-Loc Tiles are resistant to mold and mildew growth and would not promote either if water were to get under the tiles. The only time you would see mold or mildew growth would be if there were some organic material under the tiles. I often have wet cars in my garage. The floor slopes slightly towards a drain in the middle of the floor. Can I use titles? Do you have special cut outs for drains? or should I just use vented tiles? You can use our Diamond Grid-Loc Tiles in a garage where there will be water and a slope. Since these tiles allow water to flow between and under the floor, you don't necessarily need to use one of the Vented Grid-Loc Tiles, but you can interlock our Vented Grid-Loc Tiles with our Diamond Grid-Loc Tiles for that purpose. Live in the northeast where tiles will be exposed to road salt and melting road slop dripping on the garage floor. Is this product suitable for these type of conditions on occasion or any recommendations? Our Diamond Grid-Loc Tiles have been installed all over the US and Canada with great success. These tiles are made from the same PVC plastic used for piping in your home. These tiles are freeze/thaw stable and are resistant to most household and vehicle chemicals. So they would work great installed in a garage in the Northeast. I live in northern ny. We get a lot of snow and the state uses a lot of salt on the roads. How does this product hold up against salt, sand and snow? Our Diamond Grid-Loc Tiles have been used all over the US and Canada and hold up excellently to all types of climates. These tiles are made from a hard polypropylene plastic and are resistant to most household and vehicle chemicals. So salt, sand, and snow will not be a problem for these tiles. What type of jig saw or circular saw blade is best to use for cutting the tiles? Also would a Dremel Tool work in cutting the tiles and if so what is the best blade to use. For our Diamond Grid-Loc Tiles, a Laminate Blade is the best blade type to use. We do recommend running the blade at a lower speed and with some silicone or water to help alleviate the melting that occurs when cutting these tiles with blades. You can use a Dremel Tool to cut these tiles as well. The type of blade you would use is one that cuts both wood and plastic. What do you suggest for an underlayment? I am worried about noise and shifting of tiles. We recommend using our 2mm ShockPad under our Diamond Grid-Loc Tiles or you can use our 1/8" thick Eco-Flec Rolls. Both will give you ample noise reduction and will keep the floor from shifting. Can you use these on a wood deck? Our Diamond Grid-Loc Tiles can be used on a wood deck. I'm trying to find out information about grid loc tiles and radiant floor heating systems. I have radiant heat in my slab concrete for my garage and need to know if the tiles will reduce the effect of the radiant heat or if they will just heat up to the temperature of the floor and radiate heat like the floor would. Thank you. The Diamond Grid-Lock Tiles would reduce the effect of the radiant heating system. They will not transfer the heat like porcelain or ceramic tile would. Can a car jack be placed over the grid loc tiles for jacking up a car? We do not recommend placing car jacks over our Diamond Grid-Lock Tiles because there is a potential for the tile(s) to crack. Can these diamond Grid-Loc tiles be used on a concrete basement floor? We primarily use our basement for storage and indoor gardening activities such as potting plants and growing vegetables under grow lights. You can use install our Diamond Grid-Loc Tiles over a concrete floor in your basement. These tiles are a floating interlocking floor and are resistant to staining, mold, and mildew growth. With the diamond pattern on top, they are also very slip resistant. If a garage floor concrete is uneven will this work over it? You can install our Diamond Grid-Loc Tiles over an uneven garage floor to a certain extent. If there are slight dips and peaks, these tiles will perform as stated. If there are major dips or peaks, more than a 1", the tiles have a potential to separate when driven over or walked over. This could damage the tiles are cause a trip hazard. How slip resistant are these to walk on when wet. I will use for outdoor car shows and it could rain on them. Are they slippery when wet? These tiles are slip resistant when wet. Water will flow between the tiles and the pattern on the tiles will help to provide ample traction when wet. What is the dimension of ramp edge? Our Grid-Loc Edges are 3" long x 12" wide. The corners are 3" long x 15" wide. The ground in my area of Florida stays moist and my garage concrete brings up moisture very easily. In fact if I leave any kind of solid plastic such as a plastic container or a gas can on the concrete, it will have a thin sheet of water underneath it when I lift it off and when it dries it leaves a water stain. Do I need to seal the floor first before I put your product over it or will your tiles allow it to breathe without any concern for trapping moisture under the tiles? Thanks for your help. You will not have to seal your concrete floor if you install our Diamond Grid-Loc Tiles. When installed, these tiles have a gap that allows for any moisture to travel up or down through the floor to either a drain or out of your garage. Some moisture may still get trapped if coming up from the garage, and some sweating may also be present. This is not harmful to the tiles, and with the diamond pattern will not create a slip hazard. If the moisture is still a huge, you can pull up the flooring and seal your concrete floor to ensure no moisture comes up. I have a 4mm rubber mat that I would like to put under my diamond grid tiles, would that be ok on my garage floor? Putting a 4mm Rubber mat under our Diamond Grid-Loc Tiles is a great way to help to quiet the flooring and also provide some added cushion underfoot. So we are totally on board with adding that under your floor. I have a drain in the middle of my garage that has a slope to it. Will these still work? I'm afraid that I will spend a lot of money on these tiles, only to be disappointed. You can use our Diamond Grid-Loc Tiles on a garage floor that is sloped down to a drain. Typically people will use one of our Vented Grid-Loc Tiles over the drain to still allow any liquids to flow into it easily. I wash my cars in my garage. I have a floor drain in the center. Can I do that with this floor? And will I need to leave the drain exposed or will the water flow to it under the tiles? 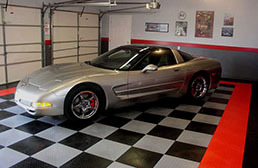 You can still wash your cars in your garage with our Diamond Grid-Loc Tiles as your flooring. The water will flow between the tiles and under the floor to the drain. If you are truly concerned about keeping the drain exposed, you can always interlock our Diamond Grid-Loc Tiles with our Vented Grid-Loc Tiles. The vented tile can be installed over the drain to allow water to flow even more freely into your drain. You can also use these tiles in the areas where you wash your cars too. I have a 4 post vehicle lift in my garage. Would I install these tiles underneath or around the lift posts? We would recommend placing our Diamond Grid-Loc Tiles around the posts and not under the posts. There is potential for the tiles to break if the posts are placed over the tile. If you would like to place the tiles under the posts, we recommend adding some plywood between the posts and the tiles to keep the tiles from breaking. Wondering how the 2mm underlay is affected by water if installed under Diamond Grid-Loc tiles? Our 2mm ShockPad will not be affected by water if installed under our Diamond Grid-Loc Tiles. Can these tiles be installed on a concrete garage that has in floor heat? You can install our Diamond Grid-Loc Tiles over concrete that has a floor heat system in it. The heat from the system will not melt the tiles. Since our Diamond Grid-Loc Tiles are non-porous, you may not get the full effect of having the system, but you will get some since these tiles do have some gapping between the tiles. Can you use Zep Focus on the tiles? We have not tested Zep Focus on our Diamond Grid-Loc Tiles, but we have tested a similar product to it called Restore that works great. This product is an acrylic maintenance coating that will help bring a shine back to your tiles. To remove this coating, you will want to use a product called Renovator Stripper. If you would like to purchase these products, please feel free to reach out to one of our Flooring Heroes via phone, chat or email and they would be more than happy to assist you. What about mold forming under the tiles? Can anyone comment on that? Our Diamon Grid-Loc Tiles are mold and mildew resistant. Mold and mildew can grow if there is organic material, but it would not grow under the tiles. The only thing that you might notice is if you have a water issue with your concrete, you may get some salt accumulation under your tiles. This can be easily cleaned and will not affect the tiles in any way. Our Diamond Grid-Loc Tiles are a 1/2" thick. Can these Grid-Loc Tiles be used outside as an outdoor patio flooring? Our Diamond Grid-Loc Tiles can be used a flooring on an outdoor patio. As long as all the tiles heated and cooled around the same time, you wouldn't have any issues with buckling. These tiles are very easy to clean and maintain and can be replaced if one were to become damaged easily. Since these tiles interlock somewhat loosely, water and any other liquids would eventually flow between the interlocks around the tile. Even though these tiles are somewhat UV stable, there is potential that over time some fading may happen. It won't be drastic, but you may notice it. I'm considering buying the Diamond grid lock tiles and was wondering if there is a planning guide that I could use to check out designs and calculate quantity and types of tiles needed? If you would like to create a custom design with our Diamond Grid-Loc Tiles you can by going to our product page and clicking on the customer designer button. Here you can create any design you like, and it will tell you how many tiles you will need and how many edges you will need as well. I like to wash my cars inside my garage. Can I use solid tiles or can I mix in vented tiles? My garage floor has a drain in the middle of the floor. Our Diamond Grid-Loc Tiles feature a treadplate design that makes them great for garages where water may be present. You can interlock in both the Diamond pattern tiles and the Vented pattern tiles to create a custom floor that will allow water to flow to the drain in your garage floor. What is the best way to cut around circular posts? The best way to cut our Diamond Grid-Loc Tiles around a circular post is to measure the area and then mark the tiles that would need to cut. If you interlock all the tiles together with the marking, you could use a rotary saw to cut the tiles.